I keep thinking I want to finish reading “Teaching in the Digital Age” before I get too much into work for the fall but I just can’t seem to get motivated. I actually finished chapter 5 a month a go the first day we were at the cottage but then we had the week at the cottage, a couple day trips and a week a Disney. I am recovered for Disney and actually went in to the school to start setting up yesterday but still having motivation issues. I am going to a 2 day workshop starting tomorrow so hopefully that will help motivate me for the year. Personally I have had some experience with videoconferencing on both the personal and professional level. 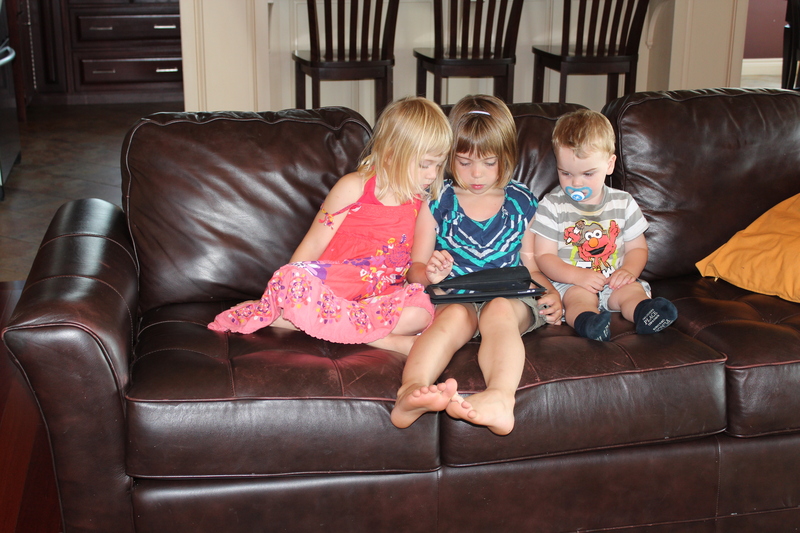 We are avid Skype users at home with my own kids. My husband often travels for work and it has been great for them to be able to communicate with Daddy. Michael is too young to understand the voice on the other end of the telephone but when he can see Daddy on the computer screen he gets very excited. My mother-in-law also lives very far away so Skype helps the kids keep in touch with her easily. Before I became a Kindergarten teacher I was a teacher-librirain and member our our school board’s Elementary Teacher Librarian group. I helped found a elementary literacy festival that involved 3 different sites in the school board. The first year we attempted to connect all three sites through video conferencing. We had some technical issues but the attempt was solid. The limiting factor with using videoconferencing in my classroom is the hardware and level of permissions. I love the idea and the possibilities but ideas explored in other chapters are more practical for me to put into place when school starts in 2 weeks. I would love to use videoconferencing to interview an expert, especially in our inquiry based classroom. I also LOVE the idea of skyping another kindergarten classroom. Last year we set up our own class twitter account and I hope to expand this year. We are planning on signing up for Kindergarten Around the World an this would be an amazing opportunity to make the experience more visual. The first step will be to get a webcam for the classroom. I will add that to my wish list (which seems to be growing rather fast). I thought it would be appropriate to create a podcast with my reflections on chapter 4. I have used podcasts in the past but now have some more ideas on how I can effectively use audio recordings in a developmentally appropriate manner in my JK/SK class. It took me a bit to figure out how to add an audio file but I managed to get to work. Another new skill! The linky for the Book blog party and a summary on chapter 4 can be found over at Teach Preschool. I have been thinking for a year about setting up my listening centre and by the end of the year I had enough points on my scholastic account to purchase the traditional set up but now I think I am glad I didn’t. I think it would be a wiser decision to figure out a way to get an iPod touch into the class. It will be easier for students to use, take up less space, and be much more conducive for sharing audio recordings we make in class. Another item to add to my wish list! Chapter 2 is on using photographs and images to inspire in the classroom. I already take a lot of photos with my class so I was interested to read this chapter. I knew in advance that the biggest difference was going to be that currently I am the one using the photographs but I need to get my class involved in interacting with images. I was pretty successful in using Evernote to take notes on this chapter so I am referring to it to write this post. It would be cool if I could find a way to import into wordpress from Evernote but I think that may be asking too much. As with all my reading I am constantly trying to find ways to incorporate different methods and teaching styles into the new Full Day Early Learning Kindergarten Program (ELK) that I will be starting in September. The first thing that struck me was to use photos to encourage questioning and our infamous ‘I Wonder’ questions. With our inquiry based learning class students are to drive the learning but before they can ask inquiry questions they need to know how to question. Sometimes they know what they want to learn but they have trouble articulating it out loud. Images would be an excellent way to model questioning! I can see starting the day with a picture on the Smart Board that the class can see as they arrive in the morning. I would first just let them approach and view it on their own. Once we meet on the carpet I would ask them if they have any questions about the image and record them around the image. Near the beginning of the year I may need to do a fair bit of modelling as to what questions I may come up with but I would hope it wouldn’t take them too long to come up with great questions independently! This could provide spin off ideas during learning centres – story writing, research, drawing, etc. The next idea that would work great in my ELK class is using photos to develop background knowledge when developing dramatic play centres. This is a great way to incorporate learning into playing and the children would never question having to do the work to help set up the centre. In the book they disussed making an Australia centre., but you could use the same strategies for any type of dramatic centre. Last year I did a unit on space and gave the students a large fridge box to make a spaceship. They had a great time but would have gotten so much more out of it if we would have first explored photos of other spaceships and what parts they might want to put on theirs. One of the big initiative in Ontario are TLCPs – Teaching-Learning Critical Pathways. This is a model of how we plan and run a critical thinking/comprehension area of our language program. Sometimes in Kindergarten we find this model difficult to run as our students are at very beginning levels of literacy. We cover different expectations throughout the year but at our school the one area we are always focusing on is making connections – text to self, text to text, and text to world. After reading chapter 2 I was starting to think that we could use digital images to help our students make connections. Peurling writes that people take photographs to capture moments in life and “When this happens, people engage in familiar discussions about people, events and stories associated with memories”. The key for our Kindergarten students to have them connect their memories and experiences. For example, if we were reading a number of books on winter then I could show them a picture of a winter scene similar to the one Puerling showed his class of the Chicago blizzard. They could make connections to events that they have experienced or books we have read. I would do this by putting my playbook beside me and recording their observations as they looked at the photos. Then I would have a record of their thought and also any prompts I had to use. A couple of other areas that I found very interesting in the chapter included using pictures to teach emotions and self-regulation, using photos to create anchor charts for behaviour at centres, and illustrating book similar to Mo Willems’ Knuffle Bunny. Finally the main thing I got from this chapter is that I need to figure out a way to get the camera out of my hands and into the hands of my students. I am not sure how to get this to happen with our expensive school cameras but I need to figure out a way! I will link to the Blog party at Dr. Jean‘s site but I wanted to mention to make sure to check out her post if you aren’t finding me from the link. I love ALL of the amazing activities she has listed. I so want to make the books with my class! One of my goals for next year is for us to make more cooperative class books. ‘Welcome to our Room’ would be great to use at the beginning of the year to help students become familiar with their classmates and to recognize their names. I want to do this before Meet the Teacher Night!! I also love the ‘Alphabet in my Mouth’ book at it would be great to make to celebrate with my JKs after we are done our Jolly Phonics letters. I had been waiting to see what the book was going to be for the pre-K/K blog party this year and was excited to hear it was selected to be: Teaching in the Digital Age by Brian Puerling. I like to thing that I am techie but I am always striving to find developmentally appropriate ways to use technology in my JK/SK classroom. This past year I found that 75% of the time I was the one using the technology and my class were simply passively observing. The only times they were engaged is when we were using the Smartboard but even then there was very little critical thinking taking place. I am starting the book study a bit late for a couple of reasons. First it took a month for my book to come in – it was on back order. Also in Canada we don’t finish school until the end of June so I didn’t have time to crack my book open until school ended. Now that school is finished and I am starting to feel relaxed I am catching up on my reading! I started by reading the introduction and chapter 1. I love how it is written very simply. I find too often I am reading education texts that I first have to think about decoding the vocabulary and it takes a bit more concentration to understand the deeper meaning. It is summer and as a rule I don’t want to have to think too hard about anything! Before I even got to chapter 1 I started to take advantage of the QR codes and I downloaded a QR code reader on my iPhone – I don’t know why I hadn’t done this earlier, it is so cool! As an aside I also downloaded one on my new playbook but I can’t get it to work. I especially like how it points out what should be obvious to me but I need to think about. For example it talks about getting media consent. I never post any pictures or names of my students on the web but this is something I need to figure out for September. I would love to have a closed website/blog that parents can view with a password and then I can post student pictures and videos. I need to figure this out. With the new ELK program we are starting in September many of our assessments and observations will be done on my new playbook through a lot of pictures and videos I would love to be able to have the students use this material more interactively and also share it with student’s families. That is one of the things I am hoping to get out of this book. Chapter 1 is entitled “The Digital Classroom”. This immediately reminded me of David Warlick’s Redefining Literacy for the 21st Century. This was a great book I used when I use to run the school library but many of the strategies I found too difficult an abstract for my kinders. Often the limiting factor is a requirement of basic literacy: reading and writing. In chapter 1 Puerling discusses the world our students are experiencing inside and outside of the classroom. As a parent I immediately thought of my own children. The reason I mention my kids is because I feel they are not indicative of the population we live in. Last year I set up a symbaloo site for my class to use at home and very few actually did. I want to set up a class website/blog but I am not sure how many families may actually use it. A few families in my class don’t have internet at home and of those that do some are still on dial-up. Our county is expanding broadband to the more rural areas but this process is slow and frustrating. This does not mean that I shouldn’t use the technologies in my class but it means that I need to be aware that my students will come with varying levels of background experience. The key is to marry the use of technology with my play based classroom. I love Bonnie Blagojevic’s comment that we need to: “Use technology to enrich, not replace, hands-on learning experiences so important to young children”. We don’t use the technology to teach the technology but rather as a tool to learning. If we keep this in the forefront of our minds I believe both teachers and students will be successful! Check out the forms at the back of the chapter. I may not be able to use all with the new way of planning in the ELK program but they will help me get organized. I want a document camera! After they were mentioned I looked them up and one would be awesome to use in my class. We could use it to share the awesome work students will be doing and exploring in our inquiry based class. Think how we can share the items my students bring in from the natural world! Use my Evernote! This is one of my goals for the summer. Come September I am hoping to use Evernote to record assessments of my students (using my new Playbook) and why not start now. I hadn’t thought of it until Karen on Pre-Kinders commented on using Evernote to record comments so I am going to try it with chapter 2.